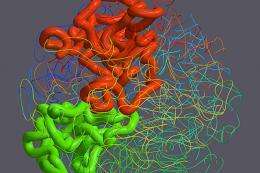 (PhysOrg.com) -- Scientists have deciphered the three-dimensional structure of the human genome, paving the way for new insights into genomic function and expanding our understanding of how cellular DNA folds at scales that dwarf the double helix. The Singularity is truly near. Ray Kurzweil must be giggling in his morning coffee reading this article. It's a huge leap forward.